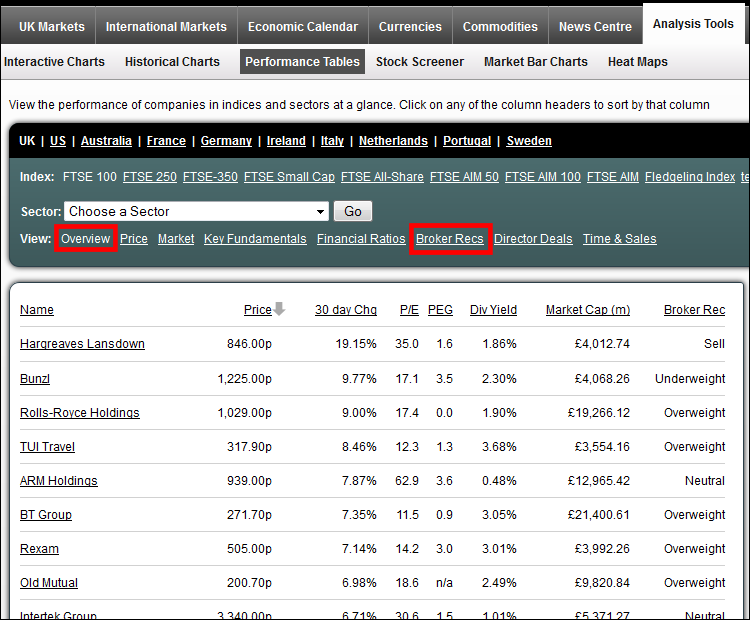 Investors can now access Broker Opinions on UK shares via the FinancialSpreads Website. FinancialSpreads.com, the UK financial spread betting website, now gives clients free access to the latest Broker Opinions which have been collated by Digital Look. The opinions cover a broad range of UK companies. The information can be viewed in a number of different formats including Performance Tables and Heat Maps. Clients can also drill down to get more data on an individual share. The Performance Table shows how many brokers have given a particular rating. They also provide a useful aggregate rating i.e. Buy, Overweight, Neutral, Underweight and Sell. Index e.g. 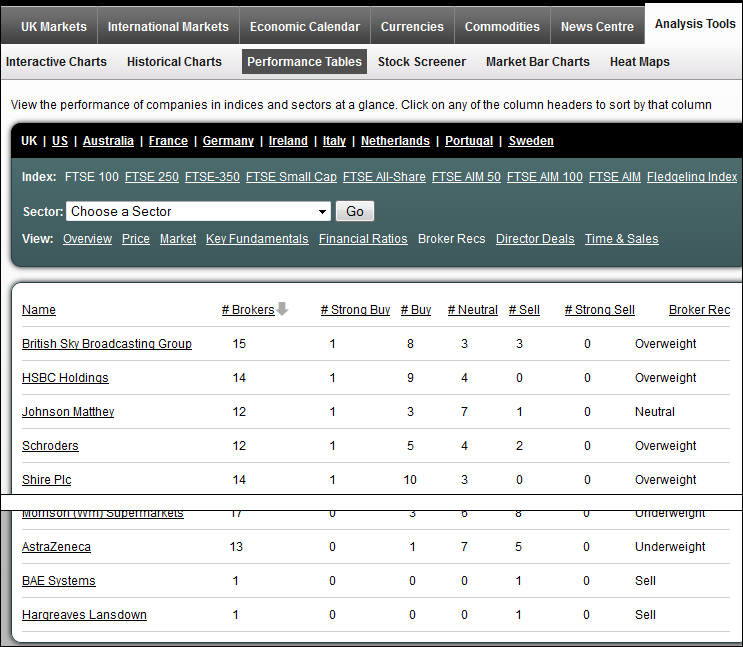 FTSE 100, FTSE 250, FTSE Small Cap, FTSE All-Share, FTSE AIM 100, techMARK etc. Sector e.g. Banks, General Retailers, Mining etc. The Heat Map gives investors a quick visual guide to the shares that have the strongest aggregate opinions. The Heat Maps can also be broken down by Index and Sector. Investors looking for more detail on a particular company can drill down and see a list of opinions for that company. The opinions are shown in date order along with the rating, the share price at the time of the rating and the target price. According to Financial Spreads spokesman, Adam Jepsen, the extra level of detail in the reports provide clients with an important overview. "Share prices sometimes move purely because of a new iteration from a broker. Therefore it's important to have access to the latest opinions in order to get a clearer picture of what could be moving a market. "However, some reports only show the most recent opinion. By giving clients the option to drill down, and see the new rating in relation to the previous ratings, they get a more comprehensive view and an important level of detail. "Of course, investors should remember that these are just opinions and before trading they should conduct their own research as to whether they think a particular share is overpriced or underpriced". The Broker Opinions are provided by a third party that is completely independent from Financial Spreads and the opinions should not be taken as investment advice. More details, including how to access the Broker Opinions, can be found on www.financialspreads.com. There are over 2,500 global markets on FinancialSpreads.com including frequently traded markets such as Sterling/Dollar, gold and the UK 100 stock market as well as less popular markets such as Dollar/Peso, Cotton and US Bonds. Financial Spreads regularly adds new markets to give clients new trading opportunities. For example, clients can speculate on markets like the Spain 35 stock market index and the Manchester United Football Club share price.